04/04/2019 (09:00PM - 09:30PM) (Thursday) : Jack (Sean Hayes) and Estefan's (guest star Brian Jordan Alvarez) romantic wedding in Spain takes a detour when their flight is cancelled, forcing them to get married at the airport by their friend Miss Coco (guest star Clinton Leupp). 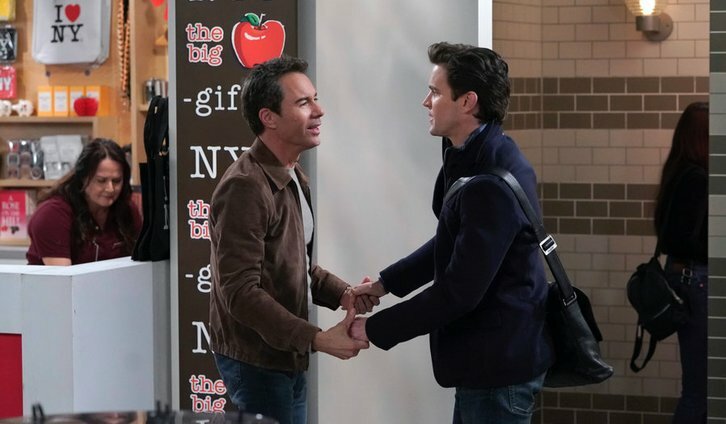 McCoy's (guest star Matt Bomer) big job offer in London has Will (Eric McCormack) worried about engaging in a long-distance relationship. While dealing with doubts about her current relationship, Grace (Debra Messing) meets a charming guy (guest star Reid Scott) at the airport who inspires her to make an impulsive decision. And advice from Smitty (guest star Charles C. Stevenson, Jr.) makes Karen (Megan Mullally) reconsider her commitment to Nikki (guest star Samira Wiley) and her own sexual orientation.